The new 1/72nd scale kit of Hayate (Squall) from Czech manufacturer Sword was a surprise, not least because the Hasegawa kit is already such a good one. Or is it? It was released at the same time as their Hayabusa. To "The Old Men of the Plastic" that still seems quite recent but to younger modellers it is already considered ancient, with that modern apotheosis of everything evil about old kits - raised panel lines! I do not know whether there is any connection between Sword and AML, but the new kit is molded in the slightly soapy grey plastic favoured by the latter manufacturer. The surface detail seems to be more finely engraved however, except for the fuselage access hatch which is raised and looks rather crude. The kit does include resin parts but not as many as in AML's hybrid Hayabusa kits or as crucial to the overall construction. In resin there are a two part engine which incorporates the mounting firewall, the wing machine gun barrels, a wheel well detail insert (as for the AML Hayabusa kits) and a mesh insert for the large oil cooler under the cowling. The rest of the kit, including the cockpit, is all molded in plastic and there is no photo-etch, thank goodness. The cockpit consists of a floor, seat, engraved console, stick, front and aft bulkheads, engraved instrument panel, cowling machine gun breeches and a gun sight in transparent plastic. There is also sidewall detail molded to the fuselage halves. The seat is plain, without ribs or lightening holes, but the latter are easy enough to drill and will improve the appearance sufficiently without having to purchase expensive aftermarket parts. Ribbing and other details may be added with hsp. The seat in the Hasegawa kit is also plain, but there was no sidewall detail and only the seat, floor, stick and a flat instrument panel with decal were included. The interior detail in the Sword kit should be enough for most tastes but a seat belt will need to be added. Sword cite dark green or translucent blue-green ("aotake") for the whole interior including the seat. Hmm. The front and top of the cowling are separate parts but the cowling sides are molded as part of the fuselage halves. This is similar to the approach taken by Hasegawa, except that the cowling front and top were molded as one piece rather than two. It remains to be seen whether Sword have captured the shape correctly by this method although built up examples look OK in images. According to reports on the net the kit is a straightforward build without any particular difficulties. Two canopy options are provided, a single piece and a three piece to allow the canopy to be posed open. They are injected rather than vacform and appear to be commendably thin and clear. There are also two separate rudders, narrow and broad chord, although the instructions are less than helpful in matching these to the markings options provided in the kit. Cowling flaps are separate parts, although molded integrally with the exhaust outlets. The spinner is one piece and harks back to the Hasegawa design without provision for a back plate to cover the blade indentations which is a feature of most modern kits. The tail wheel doors are molded separately, unlike the Hasegawa kit which were molded to the fuselage halves in the open position, and have inner face detail. The underwing fuel cooler is also a separate part and captures the actual shape very well. This was not included in the Hasegawa kit. There are also parts for the two underwing drop tanks with separate mounting brackets. Sword suggest painting these either grey-green or light blue. As already hinted colour and markings information is basic and slightly suspect. The box art has a stab at the dreaded "late war brown" whilst the three options in the kit are all given as "Nakajima green" over grey-green. Hmm again. Fortunately the decals provide for two out of three as unique options. The 50th Sentai Hayate of WO Yojiro Ofusa is especially welcome as it includes the two character aircraft name so difficult to otherwise replicate, but the suggestion of alternative white Home Defence wing bandages for this same machine is very odd. An aircraft of the 8th Rensei Hikotai (shown on the box art) with its distinctive yellow tail marking continues the unorthodox trend but the third option is an old favourite from the 57th Shimbutai. Hayate models often come in clichéd markings so Sword's more unusual choices are very welcome. 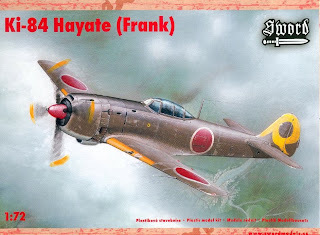 The choice of alternative markings for this kit (or the old Hasegawa one) is happily extended by the recent release of the Lifelike Hayate Part 1 set to 1/72nd scale. 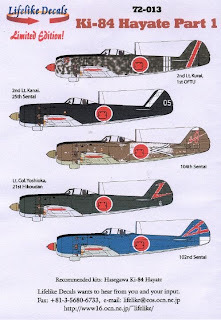 This includes China ace Moritsu Kanai's black 25th Sentai machine (possibly painted a very dark grey), the well know shooting star adorned 1st OFTU Ki-84 often attributed to "Corporal Naito" but actually flown by Lt Kurai, a 104th Sentai leader aircraft with an unusual fuselage chevron and white wingtips, the unusual blue 102nd Sentai aircraft the colour for which is based on the extant rudder and the rather plain but quite well-known 2nd Hikodan Commander's aircraft. 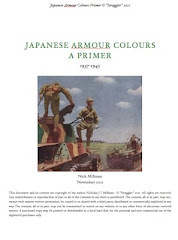 Detailed colour instructions are provided with explained references and it is good to see the use of ohryoku 7 go shoku gaining prominence in Japanese resources on the subject. Lifelike have drawn on Gakken 46 and cite it as the best source on Hayate. 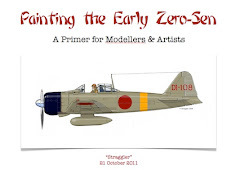 Whilst on the subject of decals Aviaeology have released some very useful sets of IJN tail codes to 1/48th scale. The sets are available from their eBay shop in yellow, red, black or white and include unit characters, numbers and letters. Hopefully they will also release them to 1/72nd scale. 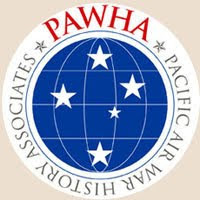 The news of the tail codes is a godsend....I have been asking decal companies to do this for years. Thanks for the heads up on this news! The extant tail comes from an example that is known to have been repainted after the war. I say this to not discount any chance the unit used blue camouflage- you know how I feel about that topic. But I think the fact they portrayed this aircraft citing the blue tail piece makes me wonder about their other color call outs. "This marking is solely based on the illustration shown in ref.1 (Gakken 46) and is said to be based on the EXISTING blue-coloured rudder with remnants of red Sentai emblem. Upper surface blue color may be close to FS5184 as shown here. 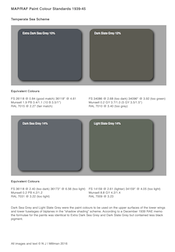 The lower surface of this A/C can be NMF, greenish gray or Navy J3 Gray color. Assuming this aircraft was built later than February 1945, we selected Navy J3 color (ref. 13). " The emphasis on "existing" is Lifelike's. Ref.13 is Koku-Fan Illustrated # 42 of 1988. 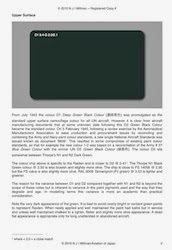 Navy J3 refers to the 2-6 colour in the 8609 document. It now appears likely that the late-war undersurface colour previously thought to have been expediently mixed from # 7 and white may actually have been matched to the 2-6 standard. Thanks for the follow-up, I do not own the Gakken book on the Hayate so this information is most helpful! 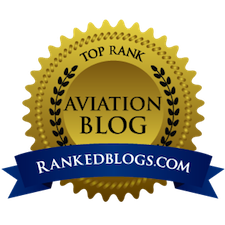 Thanks for the heads-up on the new Aviaeology tail code decals and 1/72nd Lifelike decal.